Hello friends, so far we have seen how to write program in mikroC compiler and what are the general hardware connections of our microcontroller, in this post we will look at how we can make use of 'Proteus IsIs' simulator for our projects. Before we learn anything we should know its purpose, without knowing its purpose if we try to learn something then our mind cannot concentrate 100 percent, that's the reason before I go with any new topic in this blog I always show its purpose. For every project we code, we dont know whether our code works well or not. Compiler only capable of showing 'syntax errors' but it will not worry about logic. 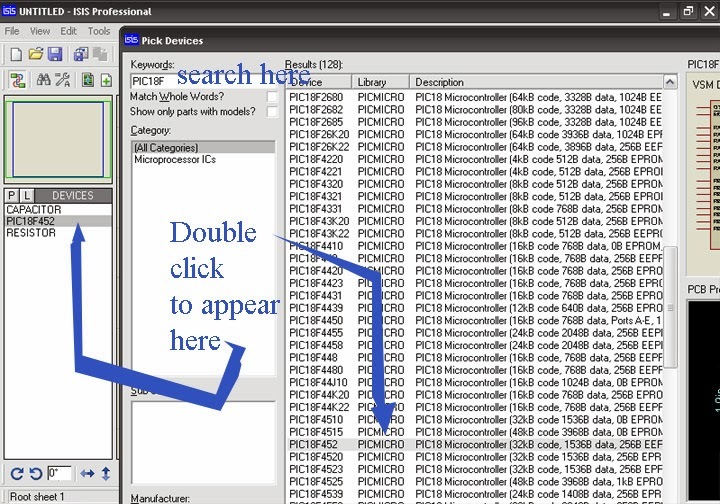 It is not possible to load our program into microcontroller every time to test our code, its time consuming & annoying. So, best way is to test our code in simulator software which acts as virtual hardware on our PC. If our code works well only then we will load our program into our real microcontroller and if our code dont works well in simulator software then we can fix bugs by changing our code in our compiler. 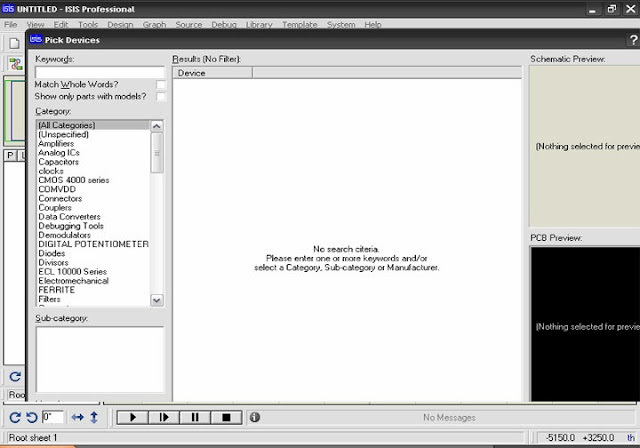 We will get many simulator softwares online, but the most famous one is the PROTEUS ISIS simulator. 'Schematic edit space', here we draw our desired project circuit diagram.we can zoom in and zoom out by using mouse scroll. If we want to draw any schematic we need components, first we should add components into the 'object select window' from 'component library window' by clicking P button(Pick button). Notice the 'category' column which is on the right side of the window, you can select component libraries from here. For example we want to add 'capacitor' in our 'object select window' then click on 'Capacitors' from the 'category' window and we can select different types of capacitors from the 'sub category' panel. When we select any component from 'category' and 'subcategory' windows, all the devices of that category will appear in 'Device' window whose schematic & PCB previews will appear in 'schematic preview' window and 'Pcb preview' window respectively. Just by double clicking on the component from the 'Device' window will appear into the 'object select window'. The best way is to search our component using "Keywords" search which is on the top. 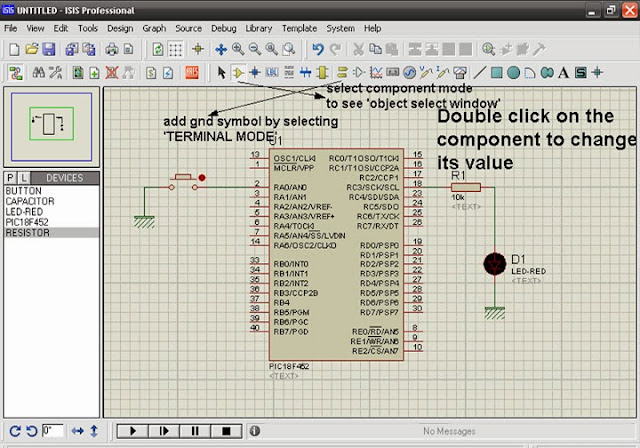 STEP4: Close your component window. 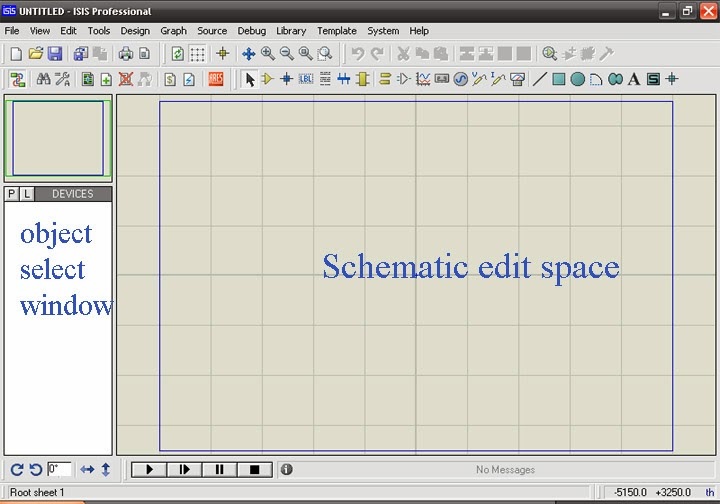 By using components in the 'object select window' draw the schematic in the 'schematic edit window' . I have just drawn example circuit with microcontroller, button, resistor, led and ground. If we want to change the component value, then double click on that device and change its value. To add 'power' , 'ground' ,etc then select 'Terminal Mode' then you will see 'Terminal' panel in place of 'object select window' , select from it, and if you want to see again your 'object select window' then select 'Component Mode'. STEP5: Set your microcontroller's clock frequency according to 'crystal oscillator' you have used while writing your program in compiler. To do this, double click on the microcontroller and change the value beside "Processor Clock Frequency", by default it will be 4Mhz. Click on 'Play' to start the simulation, while play is ON to pause the simulation press 'Pause' , finally to stop press 'Stop'. All the above steps will be common but only your schematic will change depending upon your project. ***All these above steps are very easy, only thing you need to do is to do all these steps practically on your software. You should also check [url=https://www.TheEngineeringProjects.com/]The Engineering Projects[/url] because they have posted a lot of [url=http://www.theengineeringprojects.com/2015/03/arduino-projects.html]Arduino Projects[/url] and [url=http://www.theengineeringprojects.com/2015/03/pic-microcontroller-projects.html]PIC Mirocontroller Projects[/url] and have also designed many new [url=http://www.theengineeringprojects.com/2013/03/a-complete-tutorial-on-how-to-use-proteus-isis-ares.html]Proteus Tutorials[/url]. I hope you guys are gonna like them. I bought this watch for my dad on this website on Father's Day. perfect luxury watchesThis watch has been bought since my father has been wearing it. It has been running and working very hard. perfect breitling luxury watchesThe key is that it looks no different from genuine and the design is perfect. He likes it very much.